In the past several years, I’ve done quite a bit of traveling. I’m not jetting away every month mind you, but compared to even five years ago, I’m definitely going more places. I’ve been to New York City three times, Los Angeles, Texas, San Diego and multiple trips to Ontario to visit my family. I was missing one essential travel item though: a roomy bag to house all my cosmetics and toiletries. Let me just say that putting all your stuff in a side pouch of your suitcase is not a smart idea….I’m all set now though. I have a brand new Traveler bag that I adore! RockPretty, an online Canadian retailer based out of Calgary, sent me the Stephanie Johnson Traveler Bag just in time for my recent trip to Ontario. It arrived days before I was leaving for the 17 hour drive. The first thing I noticed was how stylish it was with its Mumbai Fuschia pattern/colour. 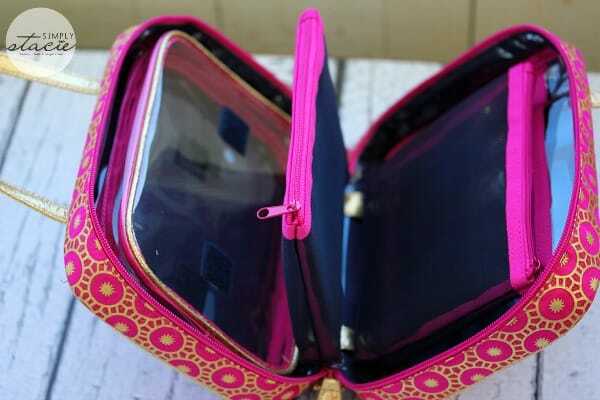 Stephanie Johnson is known for her chic travel accessories and believes that you should have both fashion and function. My suitcase is pink so the bag matches it perfectly. The gold and pink just pop don’t you think? It’s an eye-catching design. Fashion is important, but the bag also needs to be functional so that I can actually use it. I’m happy to report that it delivers on both! 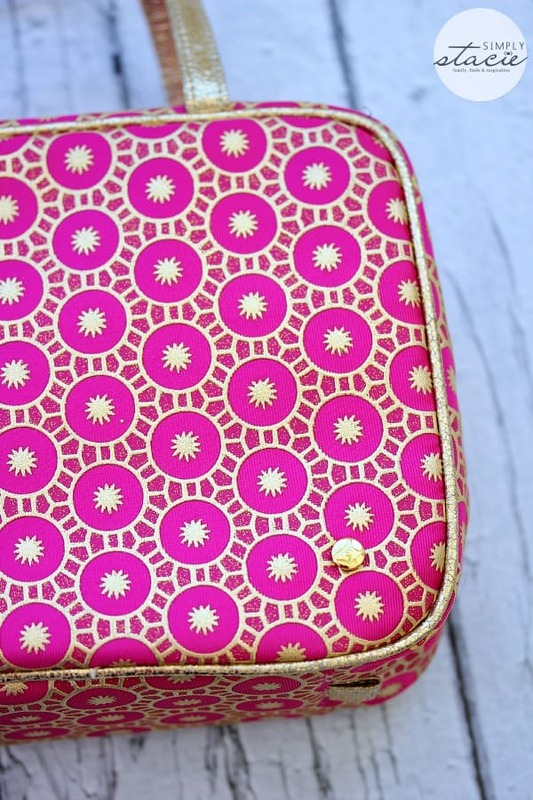 It may look small-ish, but it’s VERY roomy inside with multiple pouches and compartments to house all your essentials. The Traveler offers two snap-out mesh pouches that zipper shut, a removable clear toiletry pouch and a small circular gold coloured mirror. As I was packing for our trip, I was pleased to see that all my cosmetics, toiletries, medication, etc fit with room to spare. I put the liquids inside the clear pouch in case they leak (they didn’t thankfully), and the cosmetics and medicine went into the mesh pouches. 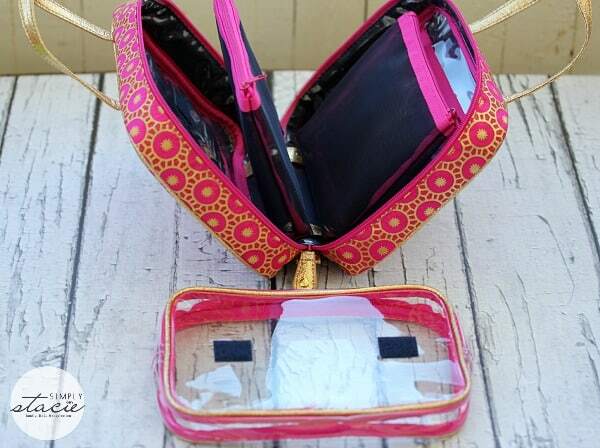 The mesh pouches are great because you can easily see what’s inside. 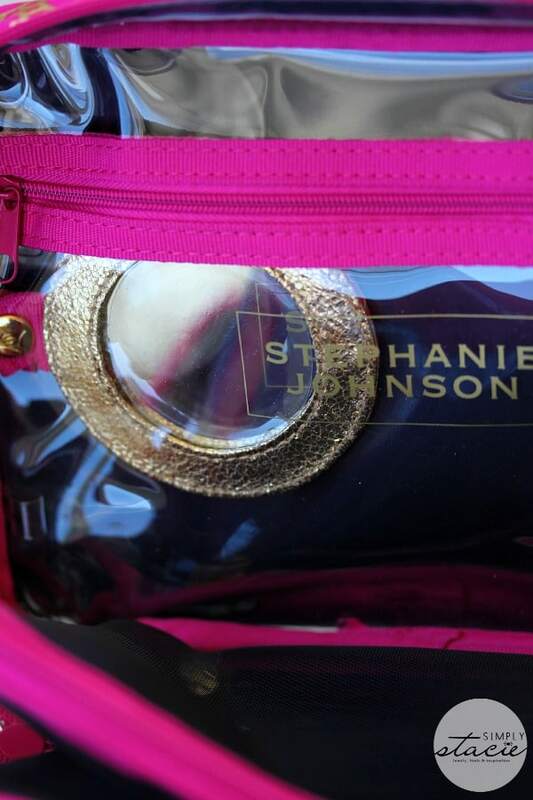 I can see why this bag is Stephanie Johnson’s most popular. I’ll be traveling in style from now on. My sister saw it while we are at my parent’s house and asked where I got it. She wanted to know if I would give mine to her. I told her that I didn’t want to part with mine and she should buy her own! 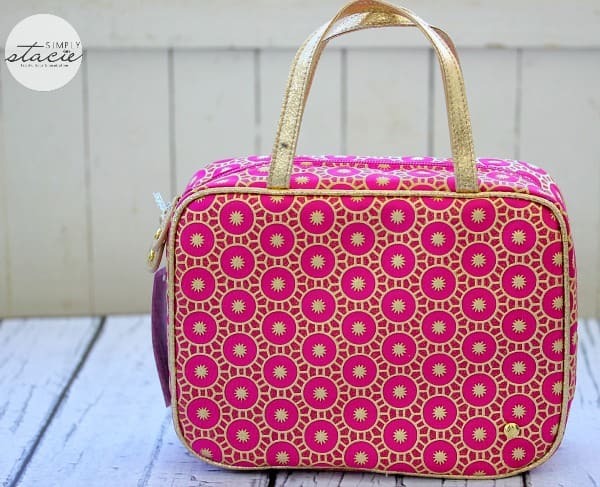 You can buy this fabulous Stephanie Johnson Traveler bag on RockPretty for $86. RockPretty offers FREE SHIPPING on orders over $75 shipped within Canada. For US folks, it’s $10 flat rate shipping. If you’re outside of the USA & Canada, you’ll be happy to learn that they ship worldwide. After you’ve had a chance to check out this bag on RockPretty, have a look around their site. Their mission is provide women with “modern, unique and eco-chic products and accessories”. You’ll find body care products, lunch accessories, hydration accessories, high quality blankets and travel bags & accessories. I found a few products that I think would make an excellent gift for my mom for Mother’s day. My parents travel all the time and my mom is stylish lady so I’m betting she’d love one of the travel bags too. RockPretty also has a loyalty program where you can earn points on each purchase. Save up your points to use for future purchases. RockPretty also has two other specialty stores: RockPrettyBaby and RockPrettyKids. Shop on all three sites and check out just once. All three are connected which makes the ordering process easy. Make sure you check those sites out too! I like to support Canadian companies and know that I’ll be shopping on RockPretty more in the future and telling my friends, family and of course, my readers all about them! I would love the traveler case!